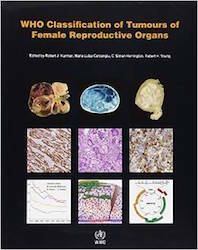 Cite this page: Hodgson A, Parra-Herran C. Endosalpingiosis. PathologyOutlines.com website. http://www.pathologyoutlines.com/topic/peritoneumendosalpingiosis.html. Accessed April 23rd, 2019. What is the expected immunohistochemical staining profile for endosalpingiosis? C. WT1+, PAX8+, calretinin-, BCL2+. As endosalpingiosis is composed of tubal type epithelium and thought to be derived from the Müllerian system, it is not surprising that this lesion is positive for PAX8 and WT1. Calretinin would be expected to stain lesions of mesothelial origin and ovarian theca origin. Studies have shown that BCL2, in addition to new contemporary markers such as FOXJ1 and phospho-SMAD2, are contemporary and promising markers for tubal epithelium and endosalpingiosis (Gynecol Oncol 2014;132:316).